Like many publishers, mine has added book trailers to its repertoire of marketing aids. A book blogger friend of mine once publicly wondered why so many book trailers are terrible. I’m not sure why. But I knew I didn’t want mine to be a lot of panning in different directions over the book’s cover, so I drove my son around Edmonton, the city where the book is set, while he filmed dirty winter street-scapes to use as the bulk of the footage for our trailer. It might not be pretty, but it’s legit. If you like, you can watch it here on the Linda Leith Publishing website or on YouTube. There’s a rather lovely glossy print lifestyle magazine published in my town every month. The December 2015 issue features an interview with me. Thanks so much to t8n. After spending the summer terrified, plunking through oral presentations spoken all in Chinese, this fall’s chance to appear in public, speaking to people about my novel in my native language seemed like a breeze. But there’s precious little in life that turns out to be easy. The week of my book launch, I came down with a cold. Grownups muscle through colds all the time. It’s not heroic or dangerous. However, my family, the MacKenzie family, has a talent for coughs and colds. We cough until we gag. We cough so loudly little children cover their ears. We cough until the blood vessels around our eyes break, giving us a scary petechiae–a rash of red-brown flecks on our skin. In the late 19th century, one of our great-great-grandmothers lost nine of her eleven young children to influenza. I’m not convinced there’s any such thing as a man-cold but I do believe in the Mac-cold: the MacKenzie cold. 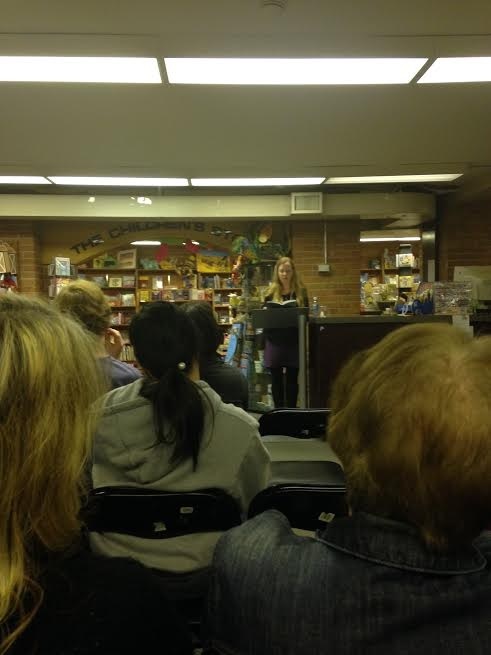 So I turned up at my book launch at Audreys Books in Edmonton with a Mac-cold. I arrived still embarrassed about having to leave a lecture earlier that afternoon to go hack in the privacy of a stairwell. All the hopes I had for the event had been reduced to one simple goal. I wanted to make it through the reading without a spectacular, face-bleeding coughing spasm. All that mattered was breath. I took my medicine, prayed, took comfort in the goodwill of the family, friends, and colleagues who came, and accomplished my reading in a low, smoky but cough-free voice. Then I came home and crashed, just like the computers at the store. From the fog of medication and illness, I missed a few event details that would have been nice. I couldn’t taste any of the cake my sister made for the guests. I also failed to set up any proper photos and am left with phone-shots to document the night. That’s okay. Someone with a Mac-cold is best seen through a fuzzy screen at a far distance anyway. And the more adversity, the more thankful I am to be in the position to be headlining the launch of my own book, for the second time, in a venerable space, surrounded by people who wish me well. Thank you, from the bottom of my lungs.